Winter is such a tough time for runners if you live somewhere that gets cold, icy, and snowy during the winter. When everyone else is hiding, you have to find the motivation to get up and either brave the slippery sidewalks, or to hit the treadmill for what feels like the billionth time. Today I thought I’d share some of the things that have helped me stay motivated to train during the winter, particularly as this is my fourth winter of running in Chicago. Winter Running Motivation Tip #1: Sign up for a spring race! Signing up for a race is great general motivation to run, and it definitely works during the winter, too. You don’t want to be the slowest person at your spring 5K or half marathon! Plus, looking forward to running outdoors when it’s a balmy 35°F in the spring can definitely helps me when I’m all bundled up on my outdoor runs and struggling to breathe through my neck gaiter. Write out your running plan into your calendar and schedule your runs, perhaps even setting an alarm on your phone to alert you when it’s time to lace up your running shoes and get going. 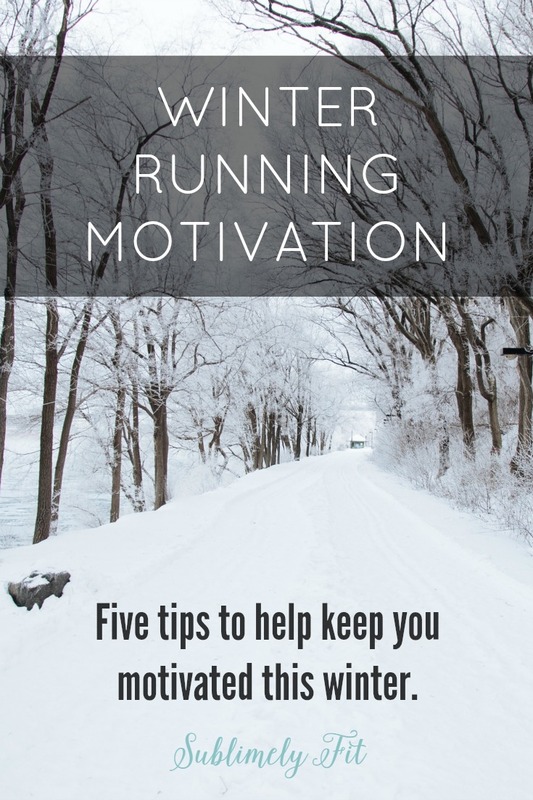 Struggling to stay motivated to #run this winter? Try these tips to keep you going! If you have the money to spend, sometimes having some new winter gear to test out can be motivational. I know when I bought my first pair of GORE-TEX running shoes, I couldn’t wait to test them out to see how well they would work in yucky conditions. Same thing with my Yak Trax. Sometimes getting new gear adds enough variety to your running to get you excited to get out there. If you’re a fan of outdoor winter running, try finding places to run that still have beautiful scenery. I love running through residential neighborhoods in the evenings in December when they all fire up their Christmas lights. And some paths in my area in the Chicago suburbs are exquisitely beautiful when it snows. Enjoying the scenery as I run is one of my most favorite reasons to run, and I love finding the beauty in my winter scenery just as much as I love watching the flowers bloom in the spring and the trees turning in the fall. This one only works for those of us who aren’t big fans of running during the hottest parts of the summer. I don’t tolerate running in the heat very well, so I’d much rather run when it’s freezing outside than when it’s blazing hot. So, I personally think about how much I despise running in the heat and how all summer I was looking forward to winter running, which helps get me out the door. Really, it’s all about finding the things that motivate you and making those things work to your advantage. How do you keep your running motivation in the winter? I’m a big fan of #1,2 & 3 on that list. I have done all of them. I love to run and watch tv shows and it helps if you restrict that show to when you run for sure. I also grab a friend and go to the gym together and get on side by side treadmills. It’s even ok that she’s not a runner, because you don’t move ahead of the person when you’re on treadmills. Getting out the door is the struggle in winter but every time I do I realize how much I actually like winter running. No overheating and the trails are so quiet. These are great tips! I hadn’t thought about #5 though so I will now! I live in WI so long, cold and icy winters are a reality. I run outside as much as I can but I’m still on the treadmill the majority of the time. I just sighed up for my first spring trail race and training will begin in February so this is my motivation! If I wasn’t on a break from running, then I would totally be all about it. Sometimes I like running in the winter, but mainly I would keep it to a treadmill. It’s really not terrible if you head out and get that blood pumping…especially if there’s snow around! I’m totally going with the first 2 right now! I have a March half marathon I’m training for and I’m watching Alias on netflix but only letting myself watch when I’m on the treadmill or elliptical. But these are GREAT ideas for getting dedicated ones through the winter!! After two spring marathons in a row – never again. I can train for a half, but when we get snow into April, it just gets to be too much. I just like to tell myself that I’m a BAMF. Which I already know, but this just proves it. As long as there’s not ice, I love winter running! #5 is totally me – I do not like running in hot weather, and winter is so much prettier. Spring races are my favorite – so nice and cool – which really motivates winter running even more! I’ve always been a year round runner, something about doing high knees in the snow with my hubby made it fun and wanting to continue doing it. Now we are training for our first ever full marathon so I guess that’s what keeps us going. I despise the treadmill and the heat! I did however purchase some new winter gear that I get to test out pretty much weekly thanks to Mother Nature! #5 is SO true, yet I don’t remind myself of that enough! Love these tips for motivation. I don’t mind running too much in the winter, but can always use some motivation to get out of my warm bed in the morning! This is when NetFlix and the treadmill don’t seem so bad.